Editor's note: David Rothkopf writes regularly for CNN.com. He is CEO and editor of the FP Group, publishers of Foreign Policy magazine, and a visiting scholar at the Carnegie Endowment for International Peace. His new book is "National Insecurity: American Leadership in an Age of Fear." Follow him on Twitter: @djrothkopf. The opinions expressed in this commentary are solely those of the writer. 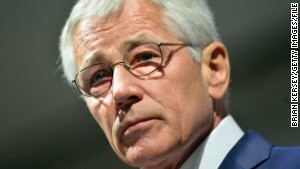 (CNN) -- Few will long lament the departure of Chuck Hagel as defense secretary. He was a weak choice for the job, seen as a comfortable one for President Barack Obama, a former senator he knew who was unlikely to ruffle feathers or be as challenging to work with as his stronger predecessors, Robert Gates or Leon Panetta. But if Obama thinks that pushing out Hagel will be seen as the housecleaning that many have recommended for his spluttering national security process, he is likely to be very disappointed. In the first instance, of course, Hagel can't be seen as the source of the tensions and frequent miscommunication that have existed between the Defense Department and the White House. Nor can White House whispers suggesting that he wasn't up to the job, especially with the new threats posed by ISIS, make that case any more compelling. No one can accuse Gates or Panetta of not having been up to the job -- and the tensions with the White House existed with them as well. Don't take my word for it. Read their books. 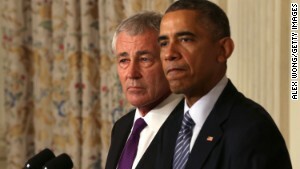 Yes, things have been coming to a head with Hagel for a while. There was reportedly a tough memo he wrote to national security adviser Susan Rice taking issue with the administration's handling of the crisis in Syria. The details have yet to be leaked, but apparently it caused a firestorm in the White House. In addition, remarks by Hagel and senior military officials such as Gen. Martin Dempsey on how to fight ISIS have revealed gaps between the White House and Pentagon thinking that have frustrated officials close to Obama. 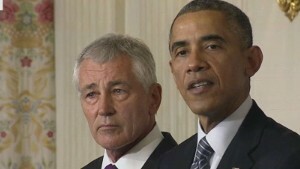 In fact, it is not passivity or weakness that some thought Hagel would bring to the job that have caused his downfall. Rather it was in part caused by his toughness and refusal to be just one more comfortable insider from the Senate club that is all Obama knew of Washington before he took office as President. Indeed, the real problem that brought down Hagel had little to do with Hagel at all. It had to do with the fact that since Rice took over as national security adviser, the Obama administration has been buffeted by a stunning series of foreign policy missteps and challenges that have shaken confidence in the President at home and abroad. These include growing chaos in the wake of the intervention in Libya, the consequences of pulling out too quickly in Iraq, compounded by the consequences of failing to take effective action of any sort in Syria, the resultant rise of ISIS, the mishandling of the National Security Agency revelations in ways that alienated our allies, the weak response to the Crimean adventure of Vladimir Putin and a host of related problems. None of these can be traced to Hagel. Rather they are linked to a broken national security process, a President who has become reactive -- not proactive -- and defensive, who is more tactical than strategic and who, unlike past presidents serving a second term, has shown a resistance to growing in office as a statesman. In past presidencies, from George W. Bush to Clinton to Reagan, such growth has been accompanied by changing up their national security teams. Many have urged Obama to oversee such a shake-up. Hagel, who assumed his post shortly after the start of Obama's second term, was a sop to these critics. Easy to dismiss, not very popular and a weak advocate for the administration. Removing him will be unsettling to those in the Pentagon who realize he is being let go for advocating their views as well as to those throughout the administration who will worry whether getting rid of him will be seen as enough. The real changes needed are at a high level in the White House, in the team immediately around the President advising him on national security. Unless those changes happen, view the Hagel move as a distraction, as an effort to create the illusion of change where a shake-up is needed.